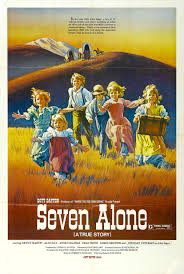 Seven Alone (1974) Rated G | What to Watch. This is based on the heartbreaking tale of the Sager family as they traveled West. It definitely shows the hardship families faced as they crossed the country by wagon. That said, the account of the children’s experiences are somewhat fictionalized to downplay the real life difficulties the Sager children faced. Although the quality of the film is lacking, the story is still compelling, seeing the heartache these children experienced, losing their parents and fighting to make their way to Oregon. If you need an emotional release and are interested in pioneer life, this movie is worth a watch. This entry was posted in 1974, Adventure, Based on a true story, family, films, Movie reviews, movies, Rated G, reviews, Western and tagged Aldo Ray, Anne Collings, based on the true story, children, Dewey Martin, family, father, fictional, film, frontier, job, journey, life, mother, movie, oregon, Sager Children, Sager family, Sager Ophrans, seven, Seven Alone, story, travel, travels, wagon west, west, worth. Bookmark the permalink.